2014 was an odd year for the Heisman Trophy. Before then, we bore witness to two straight years of out-of-nowhere Heisman contenders who were also the first two freshmen to take the vaunted trophy home, Johnny Manziel in 2012 and Jameis Winston in 2013. Then, in 2014, Oregon’s popular Heisman pick, Marcus Mariota, threw for 4,454 yards, 42 touchdowns and four interceptions, leading Oregon to an appearance in the very first championship game of the College Football Playoff. Now we’re here: 2015, and the Heisman field is open­—wide open. Ohio State has two (three?) quarterbacks with a chance, not to mention a running back who’s returning from a 1,878-yard season with 18 touchdowns. Every team in the Pac-12 seems to have a quarterback that can contend. In fact, Oregon, as usual, carries enough skill players to form its own indoor football league (seriously, Oregon’s like the ticket oak of backs and wide outs). And the SEC must think it’s 1985 or something, because the running back position has gone through a revival in the past few years (and yes, Alabama, again, has one of the best backs in the nation). This year there’s no consensus pick, and there’s a solid contender in each of the power-five conferences. Whatever happens from here, no one knows. Yes, I’m serious. Before you close the window and tell your friends how horrible of a sports writer I am, just give me a second to make my case. I understand Brissett isn’t a name that’s coming up in a lot of pre-season Heisman talk, and there are a lot of names omitted from this list that could’ve easily taken this spot. But Brissett, and NC State by extension, has a lot going for him this season. First, the ACC is as open as it’s been since Jameis Winston took it by storm. The Wolfpack also return plenty of talent on the edges and in the backfield, including its top-two rushers in Sr. Shadrach Thornton and Jr. Matt Dayes. The offensive line’s interior returns intact and one of its two vacant tackle spots will be held by Sr. Alex Barr, who made ten starts in 2014. 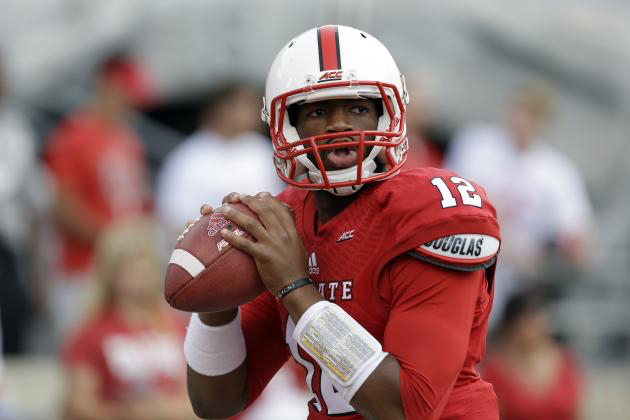 Brissett made a splash last season when NC State took Florida State to the wire, eventually losing 56-41. Brissett ripped the Seminoles defense for 359 yards passing on 32 of 48 throws with three touchdowns, no interceptions and 38 rushing yards. Brissett finished 2014 with 2,606 yards through the air and 529 on the ground, accounting for 26 touchdowns and averaging 4.3 yards per carry. This season, NC State’s schedule is a strange one, eventually becoming ruthless. Their first four games include Eastern Kentucky at home and Old Dominion and South Alabama on the road. After that, it’s all up hill. Following a showdown with Louisville at home, they play Virginia Tech, one of the toughest games on their schedule, on a Friday night. Later, they’ll play Clemson, Boston College and Florida State in three-straight weeks, the latter two on the road. Their schedule is (relatively) tough, and they aren’t exactly a top choice for ACC champs, but I’m still comfortable with having Brissett here. There are a lot of names in the Heisman race this season, many of whom play each other. But Brissett has two big things going for him: low expectations and a down conference. If, by the end of the season, many power-five teams have cannibalized one another and Heisman hopefuls everywhere carry blemishes and scars on their Heisman resumes, is it really crazy to think a dark horse like Brissett can ride on the coattails of others’ shortcomings into serious Heisman talk? In my opinion, it’s no crazier than a freshman taking the SEC by surprise and beating Alabama in Tuscaloosa on his way to a Heisman. I may have been a tad apologetic toward how I began this list, but I stand by this selection completely. ASU’s Mike Bercovici was one of the biggest storylines in the Pac-12 last season, and maybe even in college football. When starter Taylor Kelly went down last season, Bercovici took over and gave the Sun Devils some of the best production they’ve seen out of the quarterback position in a long time. With 115 completions in 2015, Bercovici amassed 1,445 yards, 12 touchdowns and four picks. His 510-yard, five-touchdown game against USC in October wasn’t only one of the best games a Sun Devil quarterback has ever put together, but ended with a 46-yard heave to receiver Jaelen Strong that became one of the most exciting moments in ASU football history, now known as the ‘Jael Mary’. 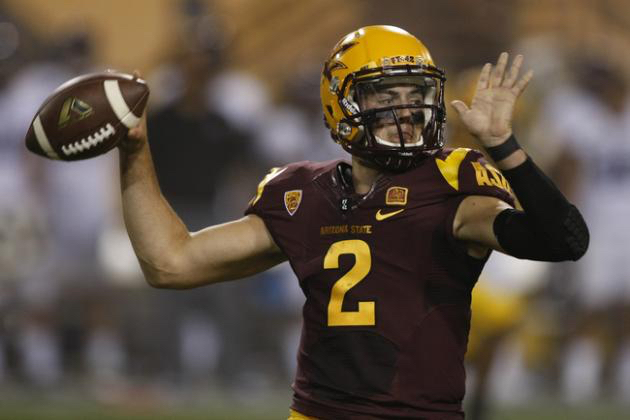 The ‘Jael Marry’ made Bercovici famous, and allowed ASU to eventually enter the CFP conversation. But, with regards to the Heisman, the ‘Jael Marry’ also represents the biggest strike against Bercovici. While Bercovici was excellent in the small amount of time he played, that’s also the problem: it was a small amount. Other quarterbacks on this list (and many left off) have years of playing experience, but 2015 will be the first time Bercovici has command of the bridge. However, even with his limited time in the huddle, Bercovici’s support staff makes up one of the better teams in the nation. D.J. Foster, the team’s leading rusher in 2015, moves into the slot to help with the loss of receivers Jaelen Strong and Cameron Smith. Running backs Demario Richard, the team’s second-leading rusher in 2015, Kalen Ballage and De’Chavon “Gump” Hayes will form a solid backfield for the Sun Devils. On the offensive line, center Nick Kelly and guard Christian Westerman were named to the Outland Trophy watch list, while Kelly also made it on the Remington Trophy watch list. This season, the Pac-12 South rivals the SEC West as the toughest division in college football, and Bercovici will have plenty of opportunities to win, and lose, the Heisman, with games against USC, Oregon, UCLA and Texas A&M on ASU’s demanding schedule. The only question is whether or not he can succeed over the course of an entire season. After years of fielding loads of talent and annually having multiple players in the Heisman discussion, Oregon quarterback Marcus Mariota finally brought the Ducks their first Heisman Trophy in school history. This year, Oregon is again overflowing with an abundance of lightning-fast potential poised to light up defenses across the Pac-12, and possibly even the nation. 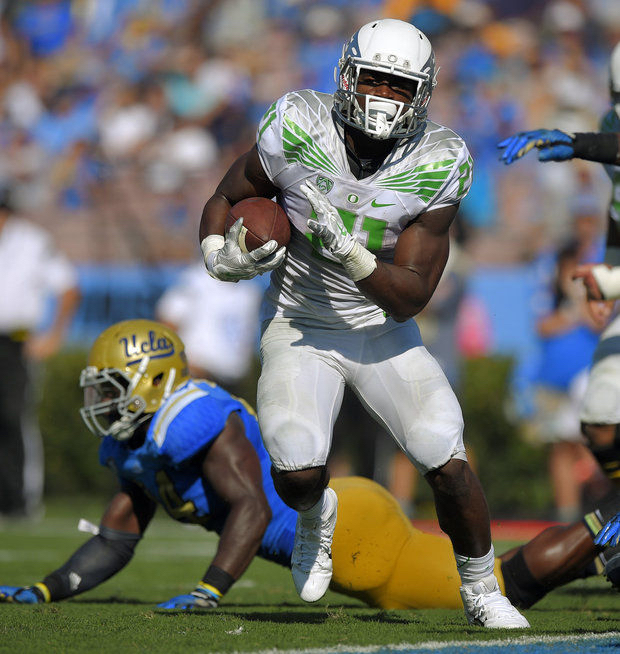 Running back Royce Freeman is one of those players. Oregon’s offense will have to deal with the loss of some key players this season, the most obvious of which is Mariota. On the line, tackle Jake Fisher and center Hroniss Grasu left for the NFL, leaving the line a bit of an unknown. At quarterback, head coach Mark Helfrich is yet to decide between Sr. transfer Vernon Adams and Jr. Jeff Lockie. In my opinion, all this uncertainty means one thing: a reliance on the run game. In 2014, Freeman ran for 1,365 yards on 252 attempts, and that was with a Heisman Trophy winning quarterback handing him the ball. This season, Oregon will lean ever more on Freeman to continue the Ducks’ high-flying, quick-striking ways, and he’ll have plenty of chances at wooing Heisman voters throughout the entire season, even if those chances will be against some of the best teams in the nation. On the schedule, Oregon’s bye-week prefaces a four-week stretch where the Ducks go on the road to Arizona State, face Cal in Eugene, face Stanford on the road, and finish with a home game against USC. Of course, none of that matters if Oregon can’t escape from their week-two road match-up with Michigan State, which is where Freeman’s Heisman chances will really take shape. If Freeman can flourish against Michigan State’s defense, one of the better defenses in the nation, he’ll be the nation’s early Heisman leader. An ugly game against Michigan State would make for a tough valley to climb out of. Similar to Oregon having a seemingly endless supply of highly-touted skill players, the SEC seems to always have two or three (or six) running backs worthy of Heisman consideration. LSU’s So. running back Leonard Fournette is the first of the SEC backs on this list. 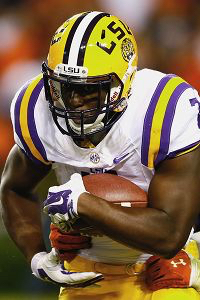 This year, Fournette doesn’t have the convenience of coming out of nowhere, and LSU hopes he can be the focal point of their run game, and possibly their entire offense, for the second consecutive year. The quarterback position is an unknown, with returning starters Jr. Anthony Jennings and So. Brandon Harris competing for the spot. Their receiving corps suffered from poor quarterback play last season, as the leading receiver, Jr. Travin Dural, only collected 758 yards. If LSU’s offense does have something going for it outside of Fournette, it’s the offensive line. Three starters from the front five are returning, giving LSU one of the better offensive lines in the nation. So, without much help elsewhere, Fournette will have to rely on his offensive line to keep the lanes open, hoping the rest of the offense can help with the load, a load that includes home games against Auburn, Texas A&M and Arkansas and away games against Mississippi State, Mississippi and Alabama. Last season, Georgia’s star running back was Todd Gurley, who headlined 2014’s Heisman class. However, Gurley missed most of the early season because of a four-game suspension and, after returning from the suspension, tore his ACL, ending his season. 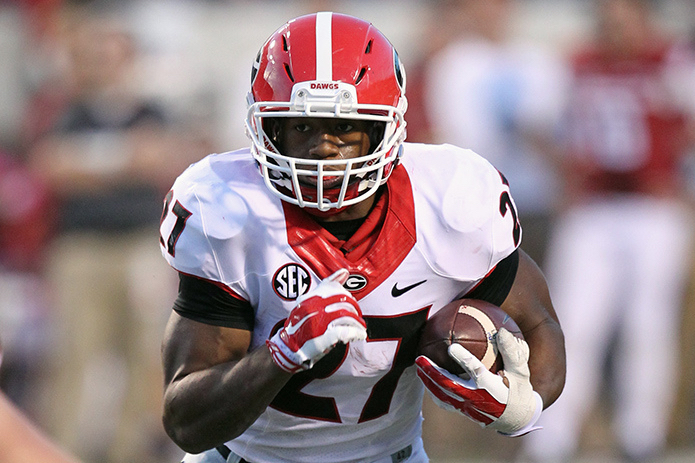 In came freshmen Nick Chubb, who took the reins of the offense and ran wild. After Gurley dropped out, Chubb ran for more than 100 yards in eight straight games, including a 202-yard game versus Arkansas and a 266-yard game in the Belk Bowl against Louisville. This season, Chubb returns to Georgia’s backfield alongside another set of off-season expectations. The Bulldogs again have a team worthy of a run at the SEC title, and Chubb is going to be key in Georgia’s success. In 2015, Chubb will have the support of an offensive line with four returning starters that is projected to be one of the nation’s top offensive lines. Everywhere else, however, is an unknown. Redshirt So. Brice Ramsey, redshirt Jr. Fanton Bauta and Virginia graduate transfer Greyson Lambert will all compete for the quarterback spot. Their top-two leading receivers are gone, with tight end Jeb Blazevich leading the returning receivers with only 269 yards on 18 receptions. So, with questions at quarterback and receiver, Chubb will be even more important in Georgia’s road to an SEC title, a road that’s dark and full of terrors (seriously, I swear this song plays every time I look at an SEC team’s schedule). The Bulldogs will face their usual SEC East foes, a road game at up-and-coming Tennessee being the most dangerous, while hosting Alabama and traveling to Auburn and Georgia Tech. Honestly, I don’t see the Bulldogs making a whole bunch of noise this season. But if they can sneak into the SEC championship riding Chubb the whole way, his chances at a Heisman will increase dramatically. It’s odd that, at least to me, it feels like USC has been mediocre for decades. In reality, the historical powerhouse has been an on-the-fringe team for a while now. In fact, in two of their previous four seasons, they’ve won ten games, and in 2014 they were a nine-win team that was a 46-yard hail mary away from 10 wins. 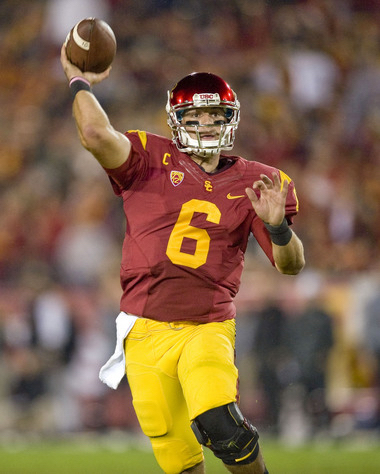 Speaking of 2014, quarterback Cody Kessler had an under-the-radar season that may have been given more attention had the team not done so poorly in the Pac-12 South. Kessler’s 3,826 passing yards were second in the Pac-12, as were his 39 touchdowns, while only (relatively speaking) throwing the ball 452 times, which ranked sixth in the conference. Unlike others on this list, Kessler will be surrounded by a loaded offense in a conference that’s not exactly known for defense (though USC’s defense may be the best in the conference, but that’s a different conversation). The offensive line returns six (yes, six) starters, making them one of the best units in the nation. They lost their top receiver, Nelson Agholor, to the draft, but there’s plenty of talent returning, including So. John “Juju” Smith, who caught 54 balls for 724 yards as a true freshman in 2014. As stated earlier, the Pac-12 isn’t exactly known for defense, but that doesn’t mean USC will stroll through the Pac-12 South—let alone the Pac-12. The Trojans will welcome Stanford, Utah, Arizona, and UCLA to Los Angeles Memorial Coliseum and take on Notre Dame, Oregon and Arizona State on the road. All of those games are as winnable as they are losable. If Kessler can lead them through that schedule, undoubtedly one of the toughest in the nation, he’ll easily punch a ticket to New York. There are certain teams with certain sets of skills that could send the college football world into complete chaos. They will look for you. They will find you. And they will kill you—r chances at the CFP. 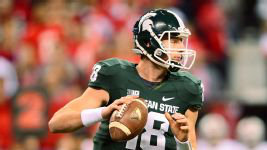 Michigan State is one of those dangerous teams, and their assault on college football begins with Sr. quarterback Connor Cook. Connor Cook’s 3,214 passing yards led the Big Ten last season, and his 24 touchdowns were second only to Ohio State’s J.T. Barrett. He also showed he could operate in the limelight last season, shining in the Spartans’ biggest games, throwing for 343 yards against Oregon, 358 yards against Ohio State and 314 yards in Michigan State’s Cotton Bowl victory over Baylor. The team surrounding Cook has lots of potential but is untested. The pieces that have been tested, however, form the foundation of any offense. Four players remained intact on the offensive line, including Sr. center and Rimington Watch List member Jack Allen. Defensively, the Spartans look to renew their status of one of the better, if not best, defensive teams in the country. With those two things, the Spartans don’t need to worry so much about what the offensive skill positions look like in pre-season. If the line blocks and the defense produces, Cook can work, and succeed, with the tools he has. And before we go, I wanted to go back to the Liam Neeson reference I made and indulge myself with a little tangent. The Spartans play Oregon early and Ohio State late. If they can beat just one of those teams and run the table, they’ll have a strong case for the CFP. And if the Spartans lose to Oregon and beat Ohio State and Ohio State and Michigan State go undefeated the rest of the way, making two one-loss teams in the Big Ten East, could we possibly—you may want to sit down—see two Big Ten teams in the CFP? I know, I know, I know, I know, that scenario is utterly and psychotically preposterous and, if it happened, would probably lead to the end of western civilization as we know it. But it’s fun to imagine, right? There are only four open spots in the CFP, which means every year, the fifth best team in the nation, and at least one power-five conference, will not be represented in college football’s new post-season. It was said when the decision to go to a playoff was made that the first team left out will be the noisiest in the post season. And, in 2014, two good teams with good resumes were left out, Baylor and TCU, both of the Big-12 conference. The thing that separated the two teams was their reaction. Baylor head coach Art Briles made noise and headlines, while TCU head coach Gary Patterson told his team to keep quiet and play football. Baylor lost to Michigan State, 41-42, in the Cotton Bowl, while the Horned Frogs decimated Ole Miss in the Chick-fil-A Bowl, 42-3. This season, the Horned Frogs are loaded and ready for another run at the CFP, as is their returning Sr. quarterback Trevone Boykin. Boykin’s 3,901 passing yards, 33 passing touchdowns, 707 rushing yards and eight rushing scores landed him fourth in the Heisman voting last season and vaulted him into 2015 as one of leading Heisman candidates. Around Boykin might be the best offense in college football. TCU’s 10 returning offensive starters including the team’s top-five leading receivers Josh Doctson, Deante’ Gray, David Porter, Ty Slanina, and Kolby Listenbee, their leading rusher Aaron Green, and four offensive linemen. The only strikes against Boykin and his colleagues are their schedule and uncertain defense. The highlight of their non-conference schedule will be Minnesota, which is a decent opponent at best. Boykin will be a Heisman finalist, and he’s going to put up impressive numbers. The Horned Frogs just have to hope their conference schedule, which includes games against West Virginia, Oklahoma State, Oklahoma and Baylor, can provide a good enough resume to let them into the CFP—assuming they run the table, that is. At one point, Ohio State had three potential starters at quarterback, all with impressive resumes and all worthy of Heisman buzz. Then, former starting quarterback Braxton Miller decided to move to wide receiver, leaving Ohio State with a deleted group of quarterbacks that now includes only two Heisman hopefuls. The quarterbacks competing to command the Buckeyes offense are So. J.T. Barrett and Jr. Cardale Jones. Thus far, it’s unclear which quarterback, both of whom would be on this list if they played for separate teams, is the front runner. Last season, Ohio State hit its first rough patch early when Jr. quarterback Braxton Miller suffered a season-ending injury before their week one game against Navy. Backup J.T. Barrett stepped into the starter’s role and shined, throwing for 2,834 yards and 24 touchdowns while rushing for another 938 yards and 11 touchdowns. The Buckeyes ended the regular season 11-1, but not before Barrett went down with an injury of his own in the fourth quarter of Ohio State’s win versus Michigan. In came Cardale Jones, whose job was to lead the Buckeyes into the Big Ten championship and, hopefully, into the CFP. Jones did just that, beating Wisconsin in the Big Ten championship and stunning the nation in beating Alabama in the CFP semi-final and Oregon in the national championship. In those three games, Jones passed for 742 yards and five touchdowns. Whomever head coach Urban Meyer chooses to lead his offense, the talent around the starter could (and some would say does) make up the best team in college football. The offensive line returns four starters, Jr. running back Ezekiel Elliot is generating Heisman buzz of his own, and six of Ohio State’s top seven receivers will be back. Ohio State’s defense, which includes All-American defensive lineman Joey Bosa, is arguably the best defense in the game. 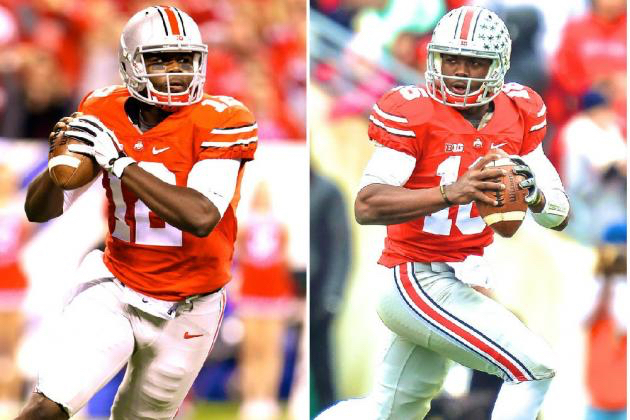 The man who wins the quarterback job at Ohio State will instantly be a Heisman front runner. Ohio State has everything else, so why not give them the top spot on this list? I’ve already talked about everything Ohio State has going for it coming into this season. But you may be asking yourself why I went with Elliot over Jones or Barrett. Well, I actually had two main reasons. First, as we established earlier, Ohio State hasn’t named a starter, and I didn’t want to pick two players to top my list. Second, no matter what happens at the quarterback position for the Buckeyes in 2015, whether it be good or bad, Elliot will be in the backfield, ready to carry the ball when his name is called. In 2014, Elliot was relatively ignored by the national spotlight mainly because of Ohio State’s quarterback situation. Regardless of the lack of attention, Elliot flourished, rushing for 1,878 yards and 18 touchdowns while receiving 28 passes for 220 yards. While Ohio State’s quarterbacks make headlines and defensive stars like Bosa boost their draft stock, I don’t think it’s crazy to predict that Elliot will have an incredible under-the-radar season. For the first time since Alabama’s Mark Ingram in 2009, a running back will take home college football’s most coveted trophy. Great article but I think it is Boykin hands down. There is a reason that a running back hasn’t won since 2009 and it is the production of the spread QB.